Seychelles is closely examining agricultural practices -- those from the past and new technologies of the future -- to increase production and boost food security in ways that can adapt to variations in climate, said a top government official. “The time has come for us to go back and revisit those good and intelligent practices that were effective then but which for some reasons or other have been abandoned and shelved, while at the same time we must bear in mind that we should move forward and innovate,” said Antoine Moustache, the principal secretary in the Ministry of Agriculture. Speaking at a one-day workshop on climate-smart agriculture on Friday at the Savoy resort and spa in the northern district of Beau Vallon, Moustache said that Seychelles has been practising agriculture for more than 200 years. The workshop was aimed at documenting and profiling climate-smart agriculture (CSA) practices and technologies in Seychelles, an archipelago in the western Indian Ocean. It was organised by the international agricultural research programme on climate change, agriculture and food security in the United Nations Food and Agricultural Organisation (FAO). 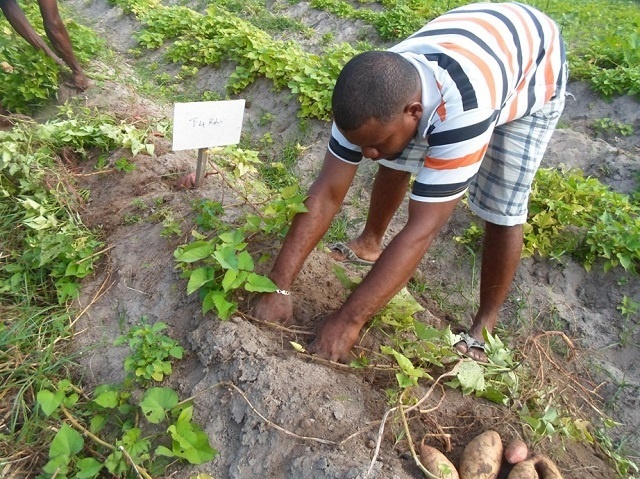 Moustache said that years ago Seychelles was self-sufficient in different agricultural production and as a result developed many of those techniques and abilities to fight adverse climate impacts on their production. “We are doing an inventory on agricultural practices particularly those that we consider intelligent practices that will help to counter the impact of climate change,” he said. Three consultants from the Food and Agriculture Organisation (FAO) led discussions in the workshop and shared their experiences as well as learned from the Seychelles’ experiences. One of the consultants, Mathieu Ouédraogo, said the meeting was to assess existing climate-smart technologies on the ground, see how far they are climate smart, see what needs to be done to further encourage the use of such methods and identify barrier constraints preventing their adoption and use. The climate-smart agriculture initiative was developed jointly by the FAO as a unified approach to address climate change challenges. Since its launch in 2010, many studies have confirmed its suitability including the Small Island Developing States (SIDs). The regional officer for the programme on Climate Change, Agriculture and Food Security, Samuel Partey, told SNA that Seychelles has more room to develop and promote climate-smart agriculture technologies. “I see this as very crucial for SIDs (small islands developing states) such as Seychelles, which is very vulnerable to climate change. Therefore to promote these technologies we are looking at the enabling environment which includes the supportive institutions, policy environment and the financial mechanism,” said Partey. He added that Seychelles is well advanced in its agricultural method, but its main constraint now is how to get access to finance since it has graduated to a high-income country. Partey recommended that the government needs to allocate specific funds for the development of agricultural technologies, which is now lacking. A draft compilation of measures and practices used in Seychelles is expected to be ready in a couple of months and once finalised it will be accessible not only to farmers but other interested partners.